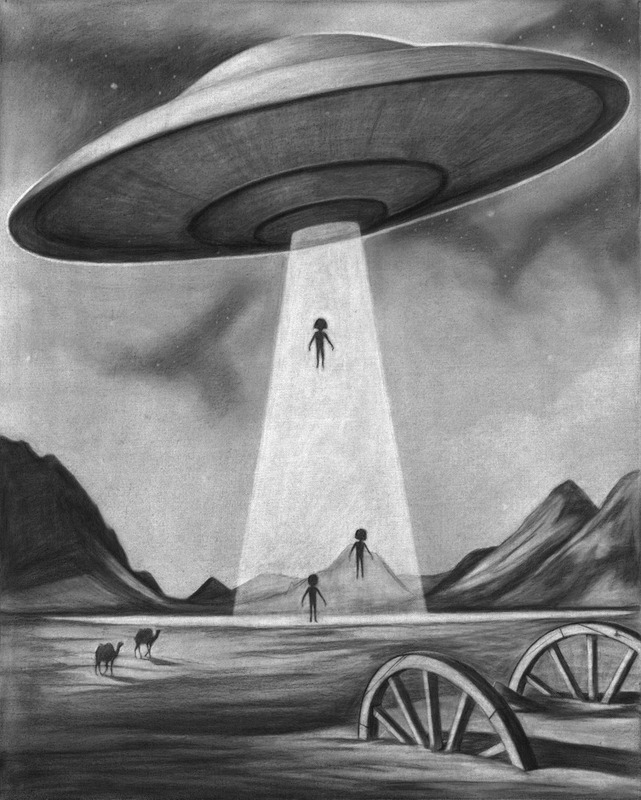 Here for her debut RUN, artist Ana Bagayan has brought us one of her many alien sketches, the catch here? It’s her very first in color! Another reason we’re excited on this one is that Ana will also be hand-embellishing each print. Read on for the 1xRUN Thru with Ana as she talks about her debut RUN, her influences and more! 1xRun: Is the original still for sale? Ana Bagayan: Not yet, I’m still thinking about what will happen with the original. 1xRun: Anything immediate you would like us to highlight? 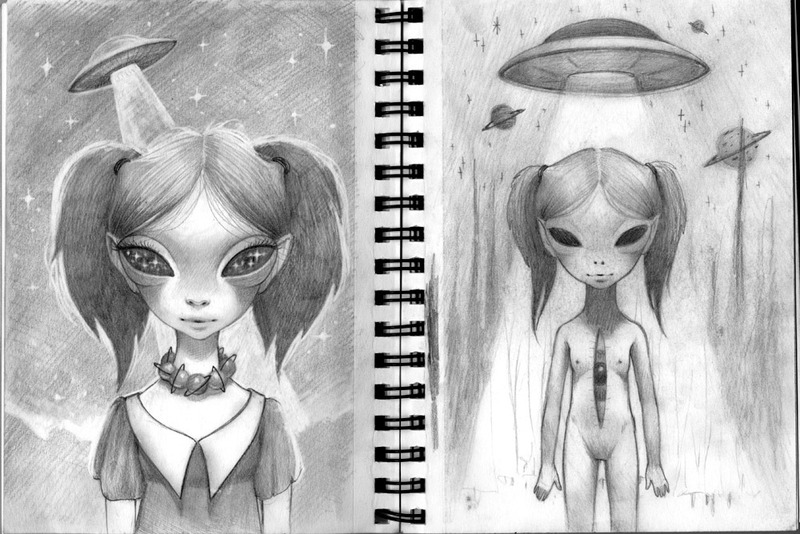 Ana Bagayan: The image is the first of a series of Alien and Hybrid beings that I’ve been developing this year. I document them all in my Alien Book, which is sketchbook that I keep with me at all times, including during sleep, so I can document all ideas relating to Extraterrestrial civilizations. 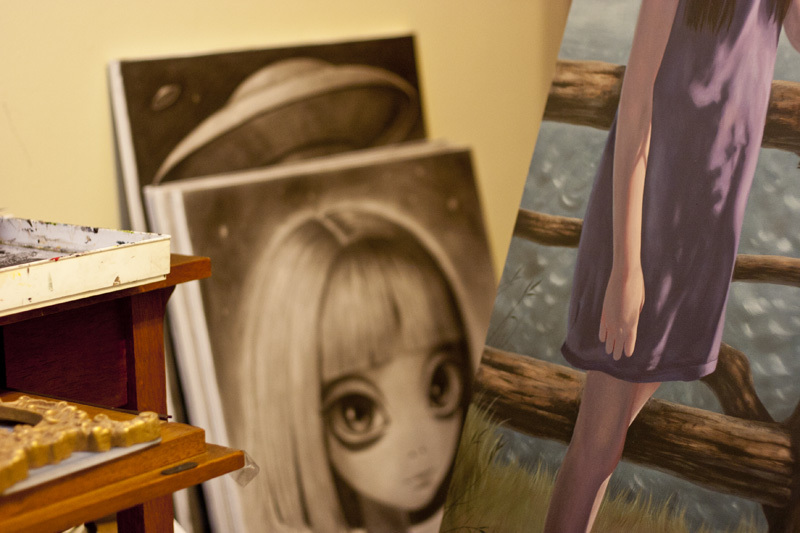 Ana Bagayan: I first started exploring this theme while I was working on my solo show at Thinkspace Gallery. I watch and listen to various things while I paint and my interests greatly influence my work because it is all an extension of my being. One day, my husband brought a documentary he had downloaded called The Experiencers, which documented hypnosis sessions of people living in different parts of the world who have claimed to have been abducted. What I loved about this film specifically was that the ‘experiences’ these people were having were mostly positive, rather than the sensationalized version we see in most movies. From that point, I have been exploring and researching and imagining what some of these lifeforms might look like and what planets they might inhabit. In addition, this lead me to a new outlook on existence and a transformation within myself that is manifesting into my artwork. 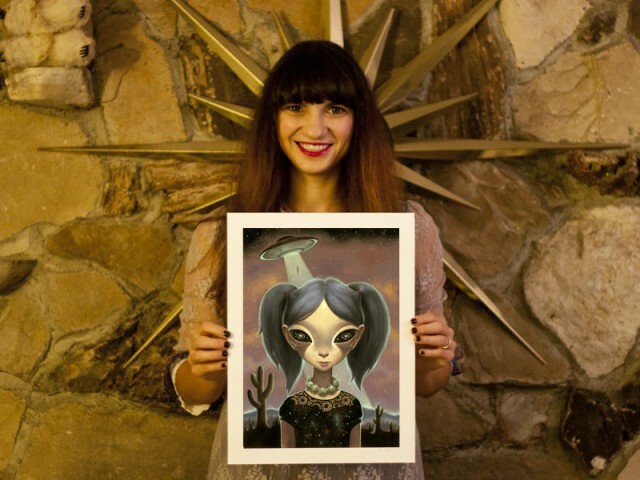 Ana Bagayan: It’s my first Alien in color. Ana Bagayan: They should buy it if they feel a connection to it, whether its the energy behind the piece or just because they just like the image. 1xRun: Describe the print in one gut reaction word. Ana Bagayan: I’ve been interested in art since I was a child, I don’t remember the exact age that I started drawing. Ana Bagayan: Currently into: Z. Beksinski, Alfred Kubin and Frans von Bayros. Ana Bagayan: Yes, mostly electronic music, dubstep, classical music, and recently I’ve been starting to like rap. I just watched the Notorious B.I.G movie. 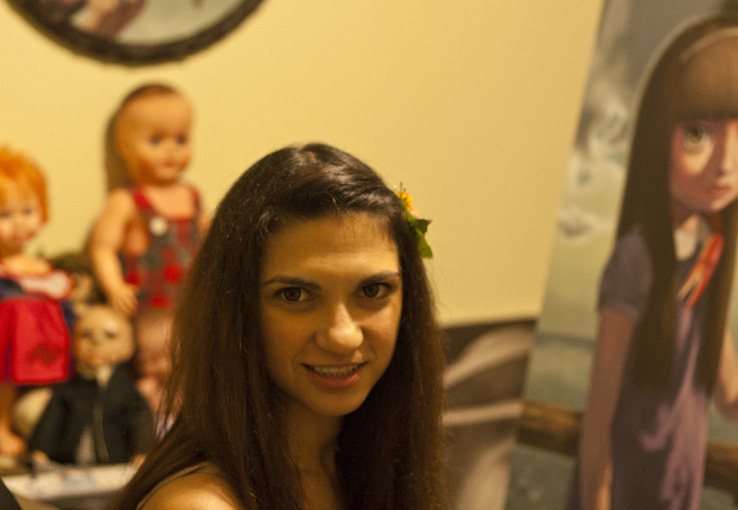 Ana Bagayan: I’d collaborate with Leonardo DaVinci and invent something cool. Ana Bagayan: I don’t remember, most of the art I have was acquired through trade with other artists. 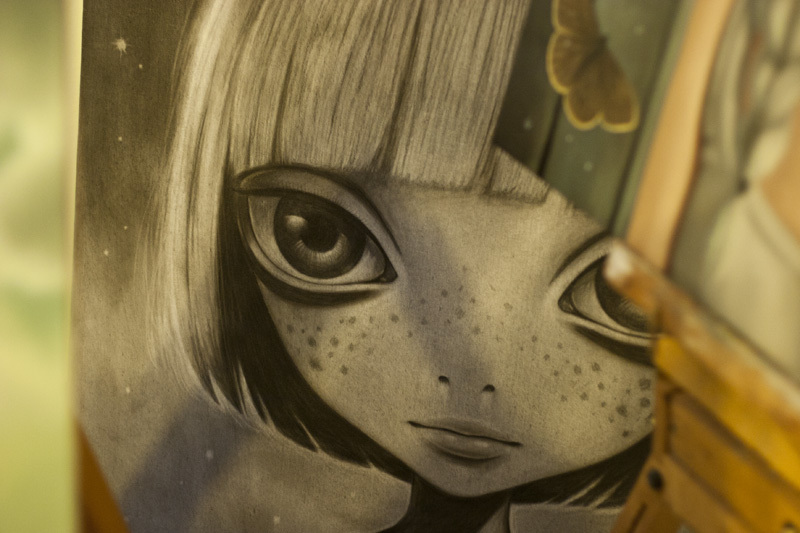 Ana Bagayan: I just bought a drawing from Yosuke Ueno. 1xRun: What else do you have in the works? Ana Bagayan: My schedule is always changing so the best way to keep up with me is to check my website and social media. I post new artwork on my site often such as sketchbook scans, drawings, and new paintings. Also, I have a few group shows coming up in June. Currently I’m working on a painting of the Power Puff girls for a Cartoon Network show at Comic Con, a piece for the Green Blood show at Dorothy Circus which benefits Greenpeace and Oceana, and a couple others towards the end of the month, in addition to doing drawings and paintings of Aliens for my own enjoyment. 1xRun: Where can people find you on the internette?